The Josephites were founded in Geraardsbergen, Belgium, on the 1st May 1817. During this year various events and celebrations will be held in all our Regions. La fondation des Joséphites date du 1 mai 1817 à Grammont, Belgique. Au cours de cette année il y aura plusieurs célébrations dans toutes nos Régions. ENCORE UNE CELEBRATION ! ANOTHER CELEBRATION ! Le 10 juin les Filles de Marie et Joseph ont célébré leur bicentenaire avec une Messe et un repas convivial à West Wickham. Le P. Richard a présidé à la Messe ; le P. Robert a prêché l’homélie sur l’esprit de Constant Van Crombrugghe partagé par nos deux congrégations. Les PP. Adrian et Martin, et le Frère Michael, étaient également présents pour célébrer avec beaucoup de Sœurs, des prêtres diocésains, et des amis et collaborateurs des Sœurs. On the 10th June the Daughters of Mary and Joseph celebrated the Bicentenary with a Mass and convivial meal at West Wickham. Fr Richard presided, and Fr Robert gave a homily on the spirit of Constant Van Crombrugghe which both our Congregations share. Frs Adrian and Martin, and Br Michael, were also present, along with many Sisters, diocesan priests, and the Sisters’ friends and collaborators. As throughout the Congregation of the Josephites, the province of Africa initiated a series of events for the celebration of the Bicentenary of the foundation of the Congregation which has existed in the world since May 1st, 1817. The events began with an inaugural conference held on the 4th March 2017 by the Superior General of the Josephites (on a canonical visit to the Province from the end of January to the middle of March 2017), on the theme of “the "Spiritual Heritage of Canon Constant Guillaume van Crombrugghe, Founder of the Josephites. This conference took place in the Marianist centre, adjacent to our college of St Etienne in the Quartier Industriel, Limete, Kinshasa. The numerous attendees consisted of the Josephites (priests, scholastics and novices), past pupils of the Josephites, the staff of College Saint Etienne, final year pupils of the college and some guests. Cocktails were offered to end this evening of Constantian celebration around 5.45 p.m.
From March 11 to 19, 2017, with the approval of the Provincial Superior, a novena to Saint Joseph was followed in every community of the province. 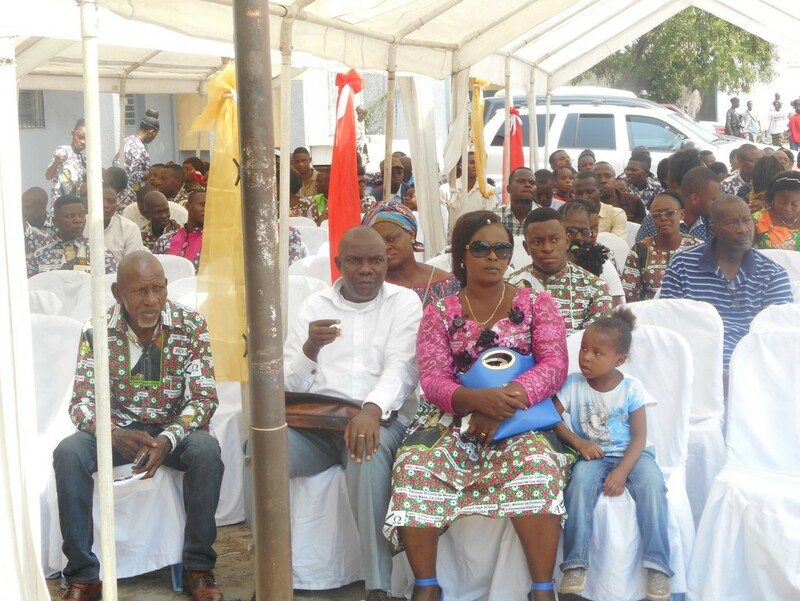 On March 25th 2017 there was an Opening Mass presided over by Bishop Donatien Bafuidinsoni, Auxiliary Bishop of Kinshasa, with Bishop Gérard Mulumba, retiring Bishop of Mweka, with some twenty Josephite priests, resident in Kinshasa and visiting, and some diocesan priests from Mweka and Kinshasa. At the end of this Eucharist, animated by the choir of scholasticate, the assembly was presented with two speeches of celebratoin and thanks, one by Father Alex Louis Mubenga cj, Provincial Superior, and the other by Joseph Balukuna Bin Biosha, President of the Past Pupils of the Josephites (ANEPEJOS) and Chairman of the Organizing Committee for the Bicentenary. There immediately followed festivities organised in the precincts of the Collège Saint Etienne, to which guests travelled from the parish church of Saint Raphael. The celebration of the Bicentenary extends throughout the year and the closure is planned for May 1st, 2018. Comme partout dans la congrégation des Joséphites, la province d’Afrique a initié une série de manifestations en marge de la célébration du bicentenaire de la fondation de la congrégation des Joséphites, qui existe dans le monde depuis le premier mai 1817. Le tout a commencé par une conférence inaugurale tenue le 04 mars 2017 par le TRP. Supérieur Général des Joséphites (en visite canonique dans la province de fin janvier à mi-mars 2017), sur le thème « HERITAGE SPIRITUEL DU Chanoine Constant Guillaume van CROMBRUGGHE, FONDATEUR DES JOSEPHITES. » Cette conférence a bel et bien eu lieu dans les installations du centre des Marianistes, contigu à notre collège saint Etienne, sis n° 4, 3ème Rue Q. industriel, C/ LIMETE, Kinshasa. L’assistance nombreuse était composée des Joséphites (prêtres, scolastiques et novices), des anciens élèves des Pères Joséphites, du personnel du collège saint Etienne, des élèves finalistes du collège et de quelques invités. Un cocktail de fraternisation mit fin à cette soirée de liesse constantinienne vers 17heures 45’. Du 11 au 19 mars 2017, avec l’aval du Supérieur provincial, une neuvaine à saint Joseph a été suivie dans chaque communauté de la province. Le 25 mars 2017 : Messe d’ouverture présidée par Mgr Donatien Bafuidinsoni, évêque auxiliaire de Kinshasa, en compagnie de Mgr Gérard Mulumba, évêque sortant du diocèse de Mweka, avec une vingtaine de prêtres cj de passage ou résidents à Kinshasa et quelques prêtres diocésains de Mweka et de Kinshasa. A l’issue de cette eucharistie, animée par la chorale du scholasticat cj, l’auguste assemblé fut soumise à l’audition de deux allocutions de circonstance et remerciement, par le Rév. Père Alex Louis Mubenga cj, Supérieur provincial et par M. Joseph Balukuna Bin Biosha, président des Anciens E lèves des Pères Joséphites(ANEPEJOS) et président du comité d’organisation du bicentenaire. Immédiatement suivie des festivités organisées dans l’enceinte du collège saint Etienne, où les invités devraient se trimballer, de l’église paroissiale saint Raphaël (1ère Rue) à la 3ème rue Industriel. La célébration du bicentenaire s’étend sur toute l’année, la clôture est projetée à la date du 1er mai 2018. On Monday 1st May a major celebration of our Bicentenary was held at St George’s College. Both the Chapel and the Refectory were full for both the Mass and the Celebration Lunch. For both parts of the celebration the Josephites were joined by members of our sister congregation, the Daughters of Mary and Joseph. Also present were members of other congregations with houses in the local area, and diocesan priests from the local parishes. We were particularly pleased to welcome from Worth Abbey Dom Stephen Ortiger OSB, Vicar for Religious, accompanied by Dom Anthony Brockman OSB, a past pupil. Concelebrating with us was Fr Brian Creek, also a past pupil. The presider at Mass was Fr Robert Hamilton CJ, former Superior General, and we were delighted that our current Superior General, Fr Jacob Beya Kadumbu CJ, made the journey from Belgium to be with us. Many past pupils, and both past and present colleagues were able to join us. A large group had made the journey from Kinson (Bournemouth), from the parish where Josephites have served for many years. Parishioners from other local parishes were also present, including those from Holy Family, Addlestone which had been served by Josephite priests for many years. The school being on holiday, it was the choir of Addlestone parish which led us in the liturgical music. During the Mass the icon of St Joseph, written by Sr Annette Lawrence DMJ, was blessed by Fr Jacob. In the coming days the pupils of St George’s College will hold their own celebrations of this event. Lundi 1 mai, une grande célébration de notre Bicentenaire a eu lieu au St George's College. La chapelle et le réfectoire étaient remplis de monde pour la Messe et pour le déjeuner convivial qui l’a suivie. Pour les deux parties de la célébration, les Josephites ont été rejoints par des membres de notre congrégation sœur, les Filles de Marie et Joseph. Aussi présents étaient des membres d'autres congrégations avec des maisons dans la région et des prêtres séculiers des paroisses locales. Nous avons été particulièrement heureux d'accueillir de l’Abbaye de Worth Dom Stephen Ortiger OSB, Vicaire pour les Religieux, accompagné par Dom Anthony Brockman OSB, ancien élève. Concélébrant avec nous était l’Abbé Brian Creek, également ancien élève. Le père Robert Hamilton CJ, ancien supérieur général, a présidé à la Messe, et nous étions très heureux que notre supérieur général actuel, le père Jacob Beya Kadumbu, a fait le voyage de la Belgique pour être avec nous. Beaucoup d'anciens élèves et des collègues anciens et actuels ont pu assister à la célébration. Un grand groupe a fait le voyage de Kinson (Bournemouth), de la paroisse où les Josephites ont servi pendant des années. Des paroissiens d'autres paroisses locales étaient également présents, y compris ceux de Holy Family, Addlestone, servis par des prêtres joséphites depuis de nombreuses années. L'école étant en vacances, c'était la chorale de la paroisse d'Addlestone qui nous a conduits dans la musique liturgique. Au cours de la messe, l'icône de St Joseph, écrite par la Sœur Annette Lawrence DMJ, a été bénie par le père Jacob. Dans les jours à venir, les élèves du St George's College tiendront leurs propres célébrations de cet événement. HOMILY GIVEN BY FR LUDO DE CLIPPEL, REGIONAL SUPERIOR IN CALIFORNIA, AT THE BICENTENARY MASS AT THE NOVICIATE HOUSE IN SANTA MARIA. In our reading from St.Paul to the Colossians, twice we were called to be thankful. Obviously, this May 1 historical anniversary in this 2017 bicentennial calls all Josephites and Sisters in the footsteps of Constant VanCrombrugghe everywhere to be grateful. The more we learn about our past (or return "to our native place" like Jesus in today's gospel) - and that remains a strong invitation for the entire year - the more admiration and gratitude well up. Gratitude first of all for our humble beginnings. See the people's reaction in the gospel: How can a carpenter's son have all this wisdom and do these mighty deeds? If we haven't done so, we should in this anniversary year read the annals of the first Josephite Superior G. Vanden Bosshe. I copied for you the page about 1816-1817. Moved by compassion for poor children, like Jesus' Sacred Heart, Constant Van Crombrugghe and Guillaume Vanden Bossche and Joseph Verkindere do what they can. Not a miracle! And they want to be called "Brothers of St. Joseph" as he is their model as foster father. Remember, two months earlier, he has started the first small community of foster mothers. Our bicentennial calls us to celebrate in awe and thanksgiving also how the Founder and the first religious superiors responded to more and more requests with more and more generosity and trust than 'reasonable.' Again, read the year by year notes of Brother Vanden Bosshe. Or browse through anniversary books of the three sister congregations: an unbelievable growth of number of schools in the second half of the XIXth century throughout Flanders. During this 2017 Pilgrimage "In the Footsteps of the Founder" we visited about ten schools that made visual and very real the enormous heritage of the Founder's initiative. In almost each school they showed us a portrait of CvC and gave us proofs of the dedication of generations of religious as well as of the power of the Holy Spirit energizing their mission. For myself, this pilgrimage to our origins and our past inspired me with more appreciation for the 408 deceased Josephites we pray for and with before supper. I thank Br.Michael who published the mortuary cards of Josephites of the first centennial (1817-1917). The two most moving experiences for me during this pilgrimage were, firstly, when about 30 African DMJ Sisters knelt around the tomb of the Founder and even wanted to touch it. There, to me, a good enough 'miracle' for canonization as a saint! Secondly, on our way back after a visit to a school or residence of retired sisters, the young sisters in the bus started singing "We are standing on the shoulders of the ones who came before us. They are saints and they are humans, they are angels, they are friends. They lift me higher than I could ever fly." Certainly, we are standing on the shoulders of some giants: as Josephites we may think here of Van Crombrugghe and our 18 past General Superiors. But we stand also on the shoulders of small people of our past about whom we know little, but in whose footsteps nevertheless we march today. And so, our thank filled commemoration of the past 200 years fills us with gratitude for, and trust in, the present and the future. We thank God that as confreres we encourage one another (like St. Paul in the first reading) to "be slaves / servants of the Lord Christ" and pray "Lord, give success to the work of our hands." Le bicentenaire joséphite est une fête des Joséphites pour les Joséphites avec les Joséphites ; une occasion pour ces derniers de se rappeler des grâces et merveilles accomplies par Dieu à travers son serviteur Constant Guillaume Van Crombrugghe, notre Vénéré Fondateur. En effet, à Ilebo, un programme bien élaboré fut arrêté pour la commémoration de cette fête. A l’issu de ce programme, les activités d’ouverture débutèrent le 18 mars 2017 avec deux conférences tenus tour à tour par le père Florent Tulantshiedi et le père Modeste Mahimba, l’une sur la vie du Fondateur Constant Guillaume Van Crombugghe, et l’autre sur l’héritage spirituel des Joséphites. Il convient de souligner que ces deux conférences ont fait également objet d’une émission à la radio, RTFM d’Ilebo par les deux conférenciers précités accompagnés du frère Jean-Marcel Mwimba comme animateur et/ou modérateur. Le dimanche 19 mars 2017, nous devrions poursuivre notre programme avec la pièce de théâtre par nos élèves du Lycée Sainte Marie et de l’I.T.C d’Ilebo, intitulé : « MATUNGULU BOMBE INTELLIGENTE ». Dans cette pièce, il était question de l’opposition des villageois contre les citadins, à cause de la maltraitance de ces derniers, dénigrant l’activité agricole. Pourtant, sans les efforts des villageois, les citadins crèvent sans appel ; c’est ce qui arrive : Abattus par la famine, les citadins sont obligés de présenter les excuses publiques aux villageois, et d’accepter toutes les doléances de ces derniers ; l’unique voie de sortie de la crise mortifère qui se vit en ville. Ce qui revient à dire que tout le monde est important pour le développement de la société. Hélas ! Cette pièce a été présentée le lundi 20 mars de l’année en cours à cause de la pluie diluvienne du jour précédent. Le 21 mars, il eu le génie en herbe de nos écoles Lycée sainte Marie et I.T.C d’Ilebo dans l’enceinte du postulat. Le 22 mars, deux conférences ont été animées par les élèves de la sixième commerciale : KAPINGA MATANGA et KAMANA NKASHAMA pour la première conférence, puis KABAMBA BEYA et MBAYA KAJA sur le système économique et le secteur minier congolais qui ne profitent pas au social des congolais. Le 23 mars, il eu deux rencontres sportives opposant tour à tour les filles du Lycée Sainte Marie à celle de L’I.T.C d’Ilebo ; ensuite les garçons des classes paires contre celles impaires de l’I.T.C. il sied de souligner que les deux rencontres se sont soldées sur un score de parité d’un par tout. Le 24 mars, deux outres conférences étaient à l’ordre du jour, tenues par deux de nos enseignants de l’I.T.C d’Ilebo. Enfin, le 25 mars, à 9h00’, c’est l’ouverture officielle du bicentenaire à Ilebo avec la célébration eucharistique, présidée par le père Georges MINGA, supérieur local, (entouré de tous les confères à l’autel, sans oublier nos collaborateurs diocésains) qui, dans son mot, a stipulé que la Congrégation des Joséphites est une œuvre divine sous le patronage de saint Joseph. Notre Vénéré Fondateur nous invite à l’humilité, à la douceur et à la politesse du cœur. Ainsi, nous Joséphites devons être des pères, mais plus encore des mères pour nos élèves afin que ces derniers fassent partie, à leur tour de notre chère Congrégation. A la suite de la célébration eucharistique, nous partageâmes un repas fraternel autour de 16h00’ où presque tout le monde, les invités y compris étaient en uniforme de la province d’Afrique, conçu pour la circonstance. NB : Cette fête réussie, a connu la participation de nos écoles d’Ilebo et de la paroisse Christ-Sauveur ! Dans le cadre de l’ouverture du bicentenaire les élevés de l’ITC et du Lycée Sainte Marie à Ilebo ont présenté une pièce the théâtre. As part of the opening of the Bicentenary the pupils of the ITC and the Lycée Sainte Marie in Ilebo put on a play. On Monday March 6th, the Josephite community in Santa Maria and the Daughters of Mary in Joseph in Southern California gathered at Old Mission San Buenaventura to officially begin our Congregations’ bicentennial celebrations. Father Tom Elewaut graciously hosted us at the mission where he is parish priest. Father Alidor Mikobi and Father Bill Garcia also joined us for this special celebration. Father Richard Lear joined us from England and was presider and homilist for our Mass. Sister Helen Vigil, DMJ, Father Charles Hofschulte, CJ, and Brother Romualdo Orozco, CJ, organized the liturgy and the gathering after Mass. Lundi 6 mars 2017 la communauté joséphite de Santa Maria et les Filles de Marie et de Joseph au Californie se sont réunis à l’Ancienne Mission de San Buenaventura pour le début officiel du bicentenaire de nos congrégations. Le Père Tom Elewaut, curé, nous à accueillis. Les Pères Alidor Mikobi et Guillermo Garcia étaient avec nous pour cette célébration extraordinaire. Le Père Richard Lear, en visite de l’Angleterre, a présidé et prêché à la Messe. La Sœur Helen Vigil DMJ, le Père Charles Hofschulte CJ et le Frère Romualdo Orozco CJ ont organisé la liturgie et la récéption qui l’a suivie. Dimanche 19 mars 2017 les quatre congrégations fondées par Constant van Crombrugghe se sont réunies dans la chapelle du Collège St Joseph à Alost pour une Messe présidé par Mgr Luc van Looy, Evêque de Gand, dans la présence de Mgr Augustin Kasajja, Nonce Apostolique en Belgique, et les Supérieurs Généraux de trois des quatre congrégations. On a regretté l’absence de la Sœur Marie-Augustine, Supérieure Générale des Sœurs de Marie et Joseph, qui était empêchée par la maladie. Après la Messe une réception conviviale était offerte dans la « Technisch Instituut » des Dames de Marie. On Sunday the 19th March 2017 the four Congregations founded by Constant van Crombrugghe gathered in the Chapel of St Joseph’s College, Alost, for a Messe presided at by Mgr Luc van Looy, Bishop of Gent, and in the presence of Mgr Augustin Kasajja, the Apostolic Nuncio to Belgium, and the Superiors General of three of the congregations. We were saddened by the absence of Sr Marie-Augustine, Superior General of the Sister of Mary and Joseph, who was unwell. After the Mass a convivial reception was held in the Technical Institute of the Daughters of Mary and Joseph. A nos écoles d'Ilebo primaires et secondaires on a ouvert le bicentenaire de la Congrégation avec deux conférences avec comme thèmes: « La vie du Fondateur » par Père Florent Tulanciedi CJ et « L'héritage Spirituel des Joséphites » par le Père Modeste Mashimba CJ. At our Primary and Secondary schools in Ilebo the Bicentenary of the Congregation was opened with two conferences whose thems were “The Life of the Founder” by Fr Florent Tulanciedi CJ and “The Spiritual Heritage of the Josephites” by Fr Modeste Mashimba CJ.